When I think about my childhood, one of the many food traditions I can recall were meat-free Fridays. Not so much for religious reasons, but being a good reminder to eat fish – at least – once a week. Wake up! (you might want to say now) There are so many more food options besides meat and fish! And I have to agree, you got a point. But having been the tiny little person in my family back then, I had little say and all the men in my family clearly demanded “proper” food to be made out of meat, poultry or fish. With a new owner, Fischhäusl at our neighborhood market – not more than a stone throw away – has reopened and our fish consumption has increased notably since. Firstly, the staff are unbelievably friendly and knowledgeable about fish, never shy of great preparation tips or recipe ideas. Secondly, our daily walk to the Englischer Garten, together with the cutest dog of all, Jackson (our semi-adopted Jack-Russell), allows us to take a peek at their super fresh offerings. While Jackson followed through his plan, which included a shortcut to the Italian food stall (where he sometimes snatches sausage piece from the generous owner), I spent my last coins for a small piece of sushi quality salmon and only minutes later started preparing the simplest salmon tartare you could imagine. Olive oil, a shallot, salt, pepper and one lime (and the bread). I’m sure, there are more elaborate recipes out there for fish tartare, but I’m 100 percent positive, that this one was the best I have eaten in a very long time. Who said the wise words, along the lines of “a dish is perfect once you can’t remove any more ingredients“? P-l-a-i-n p-e-r-f-e-c-t.
For easier slicing, put the salmon in the freezer for 15 to 20 minutes. 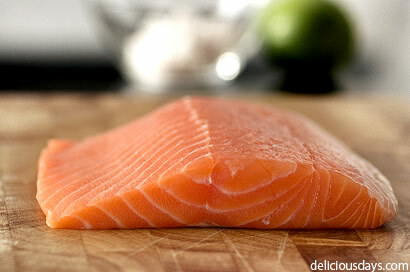 Cut the salmon into three evenly thick pieces (horizontally), then into thin stripes and lastly into small cubes. 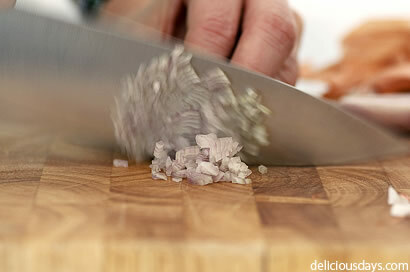 The more attention you pay to this step, the nicer the tartare will look in the end. Put into a larger bowl. Drizzle generously with very good olive oil and stir until the fish is evenly covered and looks smooth and shiny, then add the diced shallot, the sea salt and the black pepper. Wash the lime under hot water and pat dry before grating its zest over the tartare. Mix well, season to taste, cover with foil and return to the fridge. Keep the lime for later (you’ll be needing some juice). Cut the baguette (I used a stale simit, which I think added a nice twist with its sesame seeds) into thin slices. Heat a large pan over medium heat, then distribute the slices evenly and drizzle with a little olive oil. Toast shortly from both sides until golden brown and crisp. Top the little bread slices with the marinated salmon cubes and drizzle with some juice from the reserved lime (if you add it earlier the fish will loose its shiny color and turn opaque). Decorate with some fresh herbs, if at hand. I bought some crab yesterday to make a simple salad! Just crab, olive oil, lemon, celery and salt and pepper. I may head back to the market for some salmon to try your recipe! You know that a Food Post or article is super good when as you read the words, you can taste it. I love salmon and this is a keeper for its simplicty. Magic! I think the best recipes have only very few ingredients and shine through their quality ingredients. The tartare looks delicious! I just love the delicate taste of raw salmon - sushi, raw salted salmon (not really raw but anyway) and that kind of things. To die for! Delicious I'm sure. I miss your regular postings! Your pictures are divine! I love salmon best raw! Looks delicious, love Salmon especially cured or raw. Have you made gravlaxs before? Something else you may enjoy! Keep up the great photos! I went to my fishmonger yesterday and prepared your recipe fpr dinner. My friends loved it so much that I pointed them to your website. Thank you! Yes, meat-free Friday - I recall this tradition, too. 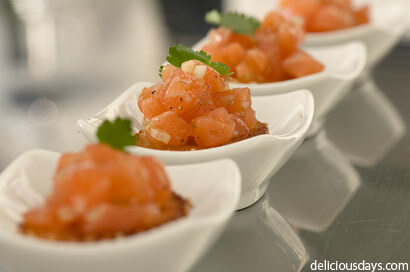 What a wonderful idea to make Salmon Tartar! And by the way: I love the Englischer Garten as well!!! I grew up with with this meatless Friday tradition as well. Brings back many memories...Thanks for this great recipe. Gorgeous site. das klingt mal wiedr köstlich! Vielen Dank für diesen wunderbaren Wochenstarter und ich wünsche Ihnen eine schöne sonnige Woche! This looks & sounds wonderfully simple to make and tasty to eat. Adding to my must make list. Just discovered your blog and have to say your photos are stunning. And the recipes look very good, too. currently living in Japan I am - so to say - right at the source of first-rate raw fish, and I adore it! I made tuna tartare with avocado just last weekend. I love salmon, too, though. who knew it could be this easy. Wow! The salmon looks fantastic. Your care in the preparation paid off, looking forward to trying it. I was just recently thinking that I would like to add a little raw fish into my diet. I write a blog too, thought I would share. I have a whole foods based, farm to table philosophy. Thanks for adding inspiration into the food blog world! Thank you for this new adress in Munich. Your pictures are as usal amazing! Your step-by-step is very informative, & delish to read. Great tip about freezing the fish to cut. I do that sometimes when I want to slice beef thinly. I'm so gonna try this tonight! I'm going to my Japanese food shop today. They are the only place where we can get sushi-quality raw fish from in Ldn. They have a monopoly because of it & it's very expensive...! habe den Artikel über Dich und Deine Küche in der SAisonküche gelesen. Da ich gesehen habe, dass keiner was dazu geschrieben hat, dachte ich, es freut Dich, wenn Du weisst, dass es von irgend jemanden gelesen ist. By the way, I saw a very interesting article about you in the new Swiss "Cuisine De Saison" (February 2009) ... I love your kitchen and style! Just like you, I'm a spontaneous cook. Why does the food look better on your blog. Salmon never looked that delicious. I've got to print some of this stuff and hand it to my mother. Good work. 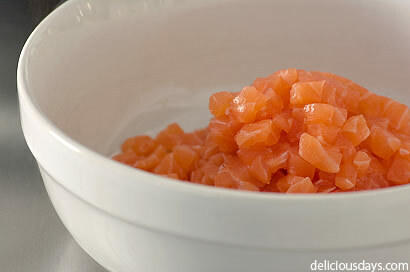 Looks delicious--I love salmon tartare! GASP! ok, this isn't about your salmon tartar, meaning no disrespect, but when I arrived at your page today, I gave a huge gasp. Those are macaroons at the top of your page and by the looks of it, they have feet. That is simply gorgeous. I just "reverse-engineered" a salmon soup that I enjoyed in Goteborg, at the beginning of the new year. I'm surprised of the several way this fish flash (so close to meat) can be cooked. Just found out how you can harvest squid ink! I love raw salmon and once bought a slab of gorgeous sushi-quality salmon, sliced it sashimi style and enjoyed it raw with a quick dip in soy sauce and wasabi. I finished a large plate on my own... it was sooooo goood! nice simple recipe ! thanks ! and the photos are also great ! It is definitely amazing how good fresh food and can be. Salmon is no exception and a wonderfully flavored fish. I try to dish out the extra money to eat a slab of the fish every week. Ich habe letztes Wochenende endlich die Gelegenheit gehabt, dieses tolle Rezept nachzukochen! I thought this recipe was amazing! It was simple to make and it tasted great. This salmon tartare was a really light and fresh appetizer. I didn't use any herbs and yet, it still tasted wonderful. I really recommend that you do take the time to cut up the salmon into nice delicate cubes because the presentation is important. very good plate, i like salmon and this is a good option for beginning dinner. I added a level teaspoon of chopped capers which livened it even more. Good either way however.